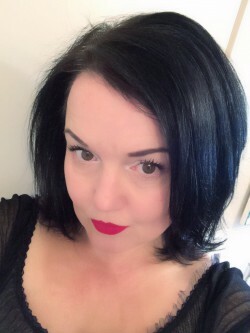 So … in the eternal struggle to find a lip colour that stays.the.hell.on, I discovered something wonderful, something fabulous, something liquidy and stay-onny … something called a Lime Crime Velvetine. And my life changed forever – well, my life as it relates to my makeup routine anyway – the rest of it stayed pretty much the same! As one who fully understands what a good, bold red lipstick can do for your day, I have decided that the Lime Crime Red Velvet Velvetine (pictured below) is 100% the way to go. It’s a gorgeous, pinup red and you guys, it just stays on all day! Through my morning coffee, another morning coffee, lunch (with coffee!) and then all the way through till I get home after work. Not bad, not bad at all. ♥ It’s easily applied with the doe-foot sponge applicator, although you do need to be a bit brave because once you’ve put it on, it ‘aint comin’ off easily! ♥ It stays on ALL day. ♥ It doesn’t transfer onto your coffee cup – or whoever you might happen to be kissing that day ;o)! ♥ I didn’t get any feathering and that is a big deal for me ‘cos I’m old! ♥ The colours are bee-yoo-dee-ful! I’ve only tried the Red Velvet and the Suedeberry (pictured above right) but I LOVE them both. The new colours are fabulous as well … I’m in desperate need of Salem! ♥ Pretty packaging … and that’s important right?! ♥ Sadly I do find it pretty drying on my lips … having said that though, as soon as you remove it, it’s absolutely fine so there’s no ongoing drying effect; just while you’re wearing it. ♥ I found my Red Velvet tube ran out a lot more quickly than I expected, which I was a bit sad about. My friend put me on to the Lip Tar range by OCC (Obsessive Compulsive Cosmetics – awesome name huh!) 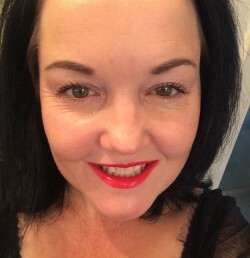 She much prefers it to the Velvetines so I bought a few colours off her which she kindly supplied in little glass vials with the OCC Lip Tar brush and off I went; here are me and my forehead wearing Harlot! ♥ The colours are incredibly vibrant and they don’t give the super-matte look that you get from the Velvetines; there’s a much more glossy effect. ♥ They smell DIVINE … like peppermint. ♥ They’re beautifully moisturising so you don’t get the parched, dry feeling throughout the day that you may get with the Velvetines. ♥ The names are fabulous; so far I have Harlot, Trollop, Radiate and Psycho! Here are some swatches of the colours on moi! Hmmm … they all look kinda the same don’t they; in real life though they are quite different. 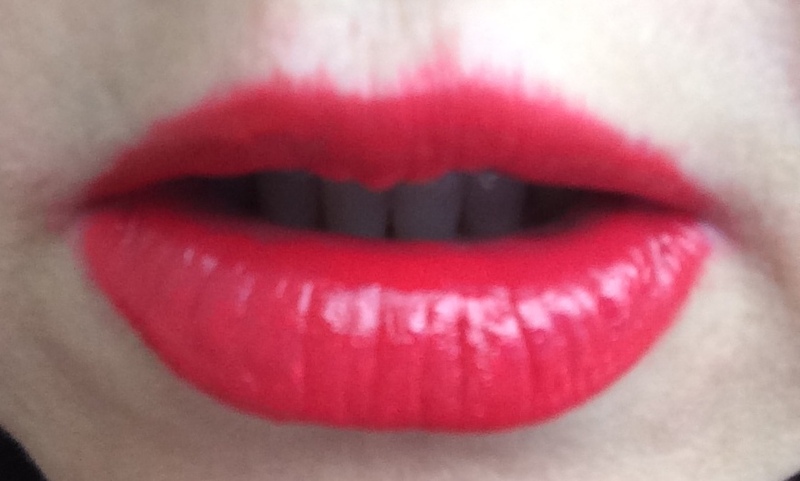 And whoops … I swatched these fast and I drew my lips a bit wonky! ♥ I find they don’t have quite the longevity the Velvetines have – they’re still relatively impressive in that regard though; maybe just 80% to Lime Crime’s 95%! 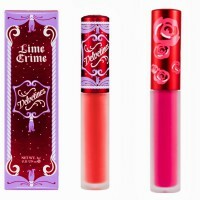 So in this Battle of the Titans, the Lime Crime Velvetine emerged the winner over the OCC Lip Tar. Posted on September 1, 2014 November 25, 2014 by MumptyStylePosted in Makeup/Skincare, Mumpty ReviewsTagged Harlot, lime crime, lipstick, liquid lipstick, mumptystyle, Obsessive Compulsive Cosmetics, OCC, pinup, Psycho, red lipstick, Red Velvet, Suedeberry, Trollop, Velvetines.